On February 16, the KCD Gearcats robotics team had an impressive showing in their season-ending robotics tournament. Through teamwork, hard work, and dedication, the team engineered a very competitive robot, falling short by just one point in the quarterfinals to the eventual tournament champion. Congratulations to team members Ayaan Jabbar, Logan Purkiss, Jerry Wu, Bryce Wunderlich, Tala Saad, Anish Bhalerao, Byrd Saylor, Nico Williams, Anya Sharma, Elly Girdler, and Paxton Kuhn on a fantastic season! 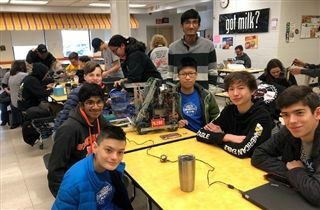 “Although we failed to qualify for the state tournament, our progress in year two of KCD’s robotics program is impressive,” said Coach Tim Rice. He also commended the team for their time, dedication, and resilience throughout the season. Congratulations to our Gearcats!